This listing is for the Sally pin from the open edition Mickey Mouse Icon mystery collection (#86540). This open edition mystery collection features various Disney Character on the Mickey Mouse icon. This pin features Sally's (Nightmare Before Christmas) teal, yellow, pink, and black patchwork dress. This listing is for the Jack Skellington pin from the open edition Good Vs Evil mystery collection (#90941). 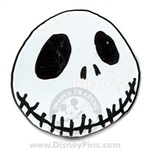 This pin features Jack Skellington, from Nightmare Before Christmas. He is inside a circle frame that is black and orange striped. This listing is for the Jack Skellington pin from the open edition Mickey Mouse Icon mystery collection (#86540). This open edition mystery collection features various Disney Character on the Mickey Mouse icon. This pin features Jack Skellington's (Nightmare Before Christmas) black bat bowtie, white shirt, and black jacket. This listing is for the Lock, Shock, and Barrel pin from the open edition "Disney's Best Friends" Mystery Collection (#90182). This pin features Nightmare Before Christmas Lock, Shock, and Barrel in a black and orange circle. Here we have The Nightmare Before Christmas Jack Skellington from the Disney Racers Mystery collection. This 16 pin mystery collection features race cars in designs inspired by classic Disney characters. Each pouch contains 5 randomly selected pins. One of a collection of 16 pins in a mystery bag of 5 featuring various characters as ice cream bars or popsicles. This pin features Jack Skellington from Nightmare Before Christmas. The top half of the ice cream bar is white and the lower half features his black pinstripe suit, including his bat bowtie with white eyes. There's a bite taken out of the top right corner of the bar with a drop of melted ice cream dripping down the right side. A tan popsicle stick protrudes from the middle bottom. This is Lock from The Nightmare Before Christmas holding his instruments, he is from a three pin set. This is Shock from The Nightmare Before Christmas holding her instruments, she is from a three pin set of "Oogies boy's." The back is silver tone, has one post with two nubs, and an irregular waffle print. There are also three boxes. This is Barrel from The Nightmare Before Christmas holding his instruments, he is from a three pin set. This Open Edition pin features Jack Skellington from Tim Burton's The Nightmare Before Christmas. The pin features a spinner element which allows you to select from ten different expressions. This open edition pin shows Jack Skellington's head in a colorful sugar skull. This listing is for Shock ONLY from the Nightmare Before Christmas: Playing Card Mystery Collection. This pin features a playing card (Ace of Clubs) with Shock holding candy canes and a mace popping up from a bunch of presents and a reflection of the same. This pin features Jack Skellington's head in acrylic, giving it a gem-like appearance. His facial features are painted on in black. This gold color pin has a Blue colored Scorpion with a pink face and bow on a green background with a blue band. It has one nub on one side of the post. This is one of the Revealed Pins. On the back it has the 2016 pin trading logo, a box containing Tim Burton's THE NIGHTMARE BEFORE CHRISTMAS, a box containing Limited Release, and a box containing ©Disney Made in China. This limited release Puzzle Reveal/Conceal Mystery collection features parts of Oogie Boogie's Roulette Wheel. There are 15 pins in the collection. Each box contains 1 of 8 Revealed Pins and 1 of 7 Mystery Pins. Nightmare Before Christmas Tsum Tsum Mystery Box- Barrel Only. Search purposes: green hair, head, round eyes, grin, grinning, toothy. Lock, Shock and Barrel in a reimagine of the Haunted Mansion stretching portrait of 3 men sinking in quicksand. Portrait is sepia tones with a metal Halloween theme frame. Oogie Boogie on a barrel of dynamite, a reimagine of the Haunted Mansion stretching portrait of a man on a barrel of dynamite. Portrait is sepia tones with a metal Halloween theme frame. Sally on a tightrope above a snake, a reimagine of the Haunted Mansion stretching portrait of the tightrope walker above an alligator. Jack Skellington sitting atop Zero's grave, a reimagine of the Haunted Mansion stretching portrait of the widow atop her husband's grave. Portrait is sepia tones with a metal Halloween theme frame. Nightmare Before Christmas Tsum Tsum Mystery Box - Shock Tsum Tsum. Search purposes: witch, purple hat, head, black hair. Nightmare Before Christmas Tsum Tsum Mystery Box - Lock Tsum Tsum Only. Search purposes: red hair, horns, devil, head, yellow eyes. Disney Tsum Tsum Mystery Collection: Tim Burton's The Nightmare Before Christmas. Jack Skellington Only. This pin features Jack and Sally from Tim Burton's The Nightmare Before Christmas with an evil Oogie Boogie pumpkin at the bottom. The pin is a detailed sculpted antique nickel metal with etched effects. There is a red/maroon banner bordering the pin that reads "Tim Burton's The Nightmare Before Christmas." Open edition released at WDW and DLR. The pin features Jack Skellington from Tim Burton's The Nightmare Before Christmas. The pin is a detailed sculptured oval of antique nickel metal. There is a banner below Jack that states Bone Daddy, with "Tim Burton's The Nightmare Before Christmas." below that. This Jack Skellington pin is similar to other pins made of him before, but it is differentiated by a print of Sally over his face. The pin also glows in the dark which pronounces Sally's image. This enamel pin set features Sally's jars from The Nightmare Before Christmas. Tim Burton's The Nightmare before Christmas rail road mystery set contains 8 pin and offered two per box. This open stock rack pin released from DLR is one of a series of NBC Tombstone pins. Each pin has a character or characters from Nightmare Before Christmas next to a tombstone with their name on it. The Mayor is featured here beside a purple headstone marker. Pins in this series include: #15717, #15718, #15720, #15721, #15723, #15725. This Limited Edition pin features Shock. This two pin set features Jack and Sally from the Nightmare Before Christmas. Both pins are done all in black and white. One pin has a picture of Sally beside the words His Sally and the other pin has a picture of Jack beside the words Her Jack. This Open pin features a framed picture of Sally from Tim Burton's The Nightmare Before Christmas. Sally is smiling and standing with her hands together at her right shoulder in front of what appears to be a spider web frame. The frame is lilac / purple. The metal is black. This listing is for the Barrel pin from the limited edition "Tim Burton's The Nightmare Before Christmas - Pumpkin Faces" Collection (#72566). Pin features Barrel's head in a pumpkin shaped. Pin is made of silver sculpted metal. Pins in this series are #73089, 80935 - 80946. This is a Disneyland 2014 Mickey’s Halloween Party "Halloween Screams" pin. It features The Nightmare Before Christmas' Jack Skellington's head as a yellow stained glass element. His head is hinged and opens to reveal Sleeping Beauty Castle, Zero, fireworks, and ghosts. This Limited Edition pin on pin features Halloweentown's Mayor from Tim Burton's "The Nightmare Before Christmas" riding in a Doom Buddy. Place this pin under a black light to reveal a hidden hitchhiking ghost. This Limited Edition pin on pin features the evil scientist, Dr. Finkelstein from Tim Burton's "The Nightmare Before Christmas" riding in a Doom Buddy. Place this pin under a black light to reveal a hidden hitchhiking ghost. This pin is part of the Doom Buddies Collection at Disneyland® Resort. This Limited Edition pin on pin features Clown with tear-away face from Tim Burton's "The Nightmare Before Christmas" riding in a Doom Buddy. Place this pin under a black light to reveal a hidden hitchhiking ghost. This pin is part of the Doom Buddies Collection at Disneyland® Resort. This Limited Edition pin on pin features Santa with Oogie Boogie from Tim Burton's "The Nightmare Before Christmas" riding in a Doom Buddy. Place this pin under a black light to reveal a hidden hitchhiking ghost. This pin is part of the Doom Buddies Collection at Disneyland® Resort. This is a Loungefly / Box Lunch exclusive. Scary Teddy the black and white vampire bear from the Nightmare Before Christmas is standing/flying in front of a purple gift wrapped present. He has red lips and a wide grin. This pin comes on a green and black decorative card. Jack Skellington from the Nightmare Before Christmas is holding a light blue snowflake star standing in front of a cobweb. This pin comes on a green and black decorative card. The back of the pin says Disney, Tim Burton's The Nightmare Before Christmas Disney Made in China. For search purposes: spiderweb, black, white, skeleton. Making Christmas is so nice. This enamel pin features Sally making her own Christmas in celebration of the 25th anniversary of The Nightmare Before Christmas. Similar to quite a few other pin designs, this Zero has large upright ears, a floating ghost dog form and an red and white peppermint candy cane in his mouth. No canine is complete without an orange pumpkin nose. From the movie The Nightmare Before Christmas. From the movie The Nightmare Before Christmas this red bag of Sandy Claws holds a host of scary toys. From an evil pumpkin Jack-o-lantern, a scary teddy bear, black cat and something with a lot of sharp silver colored teeth. Jack Skellington from The Nightmare Before Christmas stands in a green holiday Christmas wreath, a skull and crossbones in place where a ribbon would normally be placed. He's holding a red present with yellow ribbon and bow. This is the Jack pin only from set #74586. These two pin limited edtion pins will be sold together as a set and features Jack Skellington and Sally celebrating Valentine's Day 2010.
in this limited edition pin collection the citizens of Halloweentown from Tim Burton's The Nightmare Before Christmas display ads for their unusual services. This pin advertises "Behemoth's Deadly Landscape, our plants will reach out and grab you." o has a black camera on the opposite side of the circle from Mickey. Has one of the stick-style hinged backs. In this limited edition pin collection the citizens of Halloweentown from Tim Burton's The Nightmare Before Christmas display ads for their unusual services. This pin advertises "Dr. Finklestein's Creature Shop, creating a nightmare just for you." For Search Purposes: Finkelstein. amera on the opposite side of the circle from Mickey. Has one of the stick-style hinged backs. This pin was released during the 2017 Mickey's Not So Scary Halloween Party. It is a graveyard scene featuring Zero on the front gate of a cemetery underneath the words "Frightfully Fun Parade". The gate opens to reveal Oogie Boogie holding two pumpkins above the words "Mickey's Halloween Party 2017". This Limited Edition pin on pin features Sally from Tim Burton's "The Nightmare Before Christmas" riding in a Doom Buddy. Place this pin under a black light to reveal a hidden hitchhiking ghost. This pin is part of the Doom Buddies Collection at Disneyland® Resort. There are 9 pins and one complimentary pin (a total of 10 pins) in this Doom Buddies collection. Bi-monthly Magic is in the Air pin, featuring Zero the ghost dog from The Nightmare Before Christmas. Zero flies over a green and purple background. Zero, grave stone and spiral hill are pin on pin feature. Jack, dressed as Santa leans over the back of a green arm armchair in which Sandy Claws sits reading his list. This pin was sold at the 2011 Nightmare Before Christmas pin trading event at the Disney Soda Fountain. Pin is on a unique NBC backer card. Pin is approximately 2" x 2"
This is the second pin in the set of 4 NBC/HM Holiday pins released in the month of October. All the pins are based on the stretching pictures in the HM. This pin is rectangular and has the Candy Snake from NBC with a teddy bear coiled in it's tail. The snake's head is pin on pin (3D). From Tim Burton's "The Nightmare Before Christmas" This pin is based on art by Tim Wollweber who, along with Sheri Lundberg, produced much of the artwork for Haunted Mansion Holiday. Backstamp on pin is "Series 4 of 4". It's "True Love" for Jack Skellington and Sally in this Open Edition pin. It is a simple flat pin, no dangles or anything special. From The Nightmare Before Christmas for Valentine's Day. There is a large red heart as part of the background and Jack is holding a rose. Disney Studio Store Hollywood Spoon Series featuring Lock, Shock, and Barrel from The Nightmare Before Christmas. The pin is completely 3D sculpted silver metal. The three hooligans are peeking from behind the spoon handle, a spiral staircase winds upward with Shock on the bottom left, Lock on the center right, and Barrel on the top left. There's a spiral lollipop at the top of the spoon handle. Santa Jack & Zero pin sold at the 2011 Nightmare Before Christmas pin trading event at the Disney Soda Fountain. Jack is carrying Zero and a green sack. They are in front of a large building with a clocktower and lights are on in the windows. There are 2 decorated Christmas trees beside the building. Pin is on a unique NBC backer card. Christmas trees are pin-on-pin and snow is glitter. Pin is approx. 2" x 1.75"
This pin features Zero from The Nightmare Before Christmas laying in his dog bed by the fireplace. In front of him is his dog bowl with Zero spelled on it. There is a candy cane in the dish. A doll lays over the side of the dog bed. Some of the enamel has a metallic sheen. This pin features Halloween Town's Mayor with Lock, Shock & Barrel from The Nightmare Before Christmas reading a book against a stone archway. The Mayor's face spins to reveal both his happy and sad expressions. Some of the enamel has a metallic sheen. This pin features Oogie Boogie and Sally from The Nightmare Before Christmas. Oogie is pictured with his arm around a concerned Sally's shoulders. Sally is holding a black cat. The background features red dice with a metallic sheen. This pin is a spinner which shows the Haunted Mansion on one side and the Haunted Mansion Holiday on the other.The front of this pin features the Haunted Mansion with three ghostly shadows in the front. The top center of the pin features a skull and cross bones. The bottom center of the pin features the D60 logo. Disneyland Haunted Mansion Holiday 2017 Annual Passholder pin featuring Oogie Boogie from The Nightmare Before Christmas. Oogie is celebrating the holiday by getting ready to eat some of his bugs. Oogie Boogie stands behind an iced gingerbread version of The Haunted Mansion with spiders and other bugs attached to front with icing. The top of the gingerbread house is open and it is filled with candy. Oogie Boogie's right hand is holding a fork with a spider and a worm wrapped around it. It moves up to his mouth. The left hand is holding a worm and a worm is hanging from his mouth. This listing is for the Oogie Boogie Completer Pin ONLY from the Halloween 2014 All Tricks, No Treats boxed pin set (#105026) The pin series features Villains giving out candy - but they've been tricked! It's their villainous sidekicks, disguised in costumes of good characters, who are trick-or-treating for their candy! Oogie Boogie, from Nightmare Before Christmas, with Lock, Shock, and Barrel in their masks of a devil, witch, and skeleton. DLR exclusive Pin of the Month series: Windows of Evil #5. The pin features Oogie Boogie from the film The Nightmare Before Christmas. The pin resembles a cathedral style window. The border is sculpted silver tone and resembles staggered bricks. At the bottom corners are bugs, intertwined around the bricks are snakes, and at the top there is a pair of dice. In the window portion of the pin Oogie Boogie takes a prominent position with a bright yellow moon behind him and two tone blue swirls. At the bottom are Shock, Barrel, and Lock beneath a half circle of Oogie's roulette. The enamel fill of the kids dips like a soft enamel but they are glossy. From Tim Burton's The Nightmare Before Christmas. Pin 1 7/8'' H. Enamel cloisonné. Imported. Pin characters include Sally and Jack Skellington in back with Lock, Shock & Barrel holding trick-or-treat bags in front.